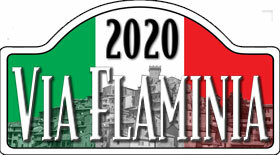 Join the Via Flaminia Classic in June 2020 towards central Italy. 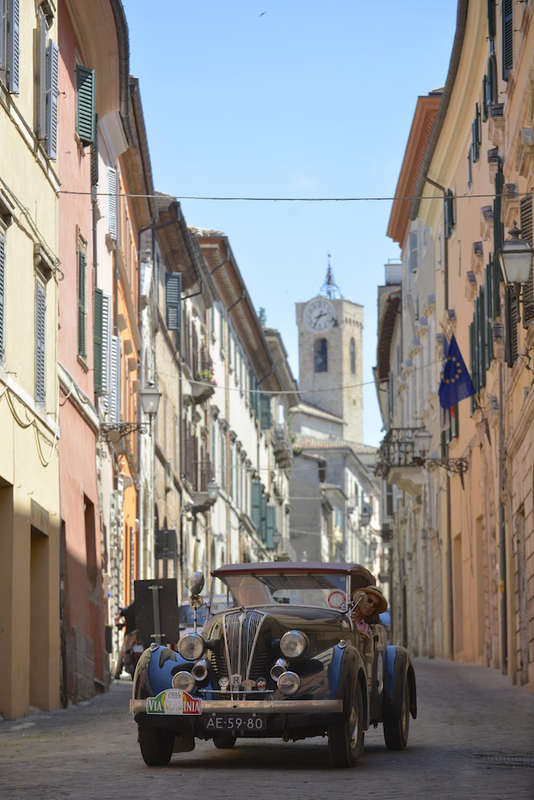 The 16th edition of the Via Flaminia has the subtitle “Borghi e Palazzi” or “villages and palaces”. We will be staying in restructured villages and palaces, which is a word used widely in Italy and refers to large (family) mansions. 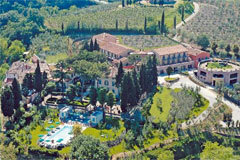 The rally starts at a Villa San Paolo in the commune of San Gimignano at a short distance from the Firenze Airport. 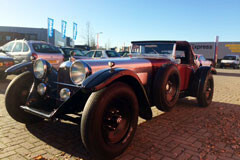 We will be bringing your classic car to the airport and you should be in time at the hotel to indulge at the pool. 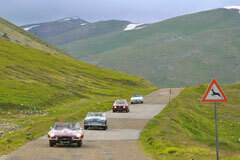 The next day, on Sunday, we will be crossing the Apennines to the east. A very nice drive, leaving Tuscany and taking the smaller roads gently climbing into oblivion, leaving civilisation behind us, replacing traffic for cows and old Fiat 500’s. Our destination is a picture-book perfect walled village, which has been converted to accommodate guests. How come I haven’t found this gem before? For two nights we take much of this hill-perched village for ourselves and will be discovering the surrounding Marche region on the next day. 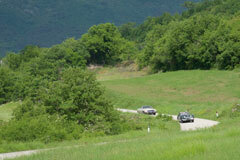 Ranges of lush hills with the Adriatic as backdrop are the setting for our trip. From the Marche we drive back over the Apennines into Umbria and we come to a marvel, which even surpasses the previous village. This fortified village is often used for weddings. It is well rebuilt to modern standards and even has a swimming pool. 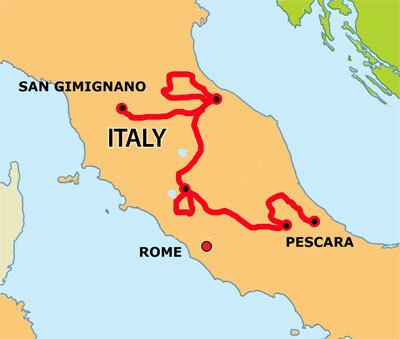 The next morning we will have a short drive leaving the option to you to either indulge at the pool or discover Orvieto at a few kilometres from our village. 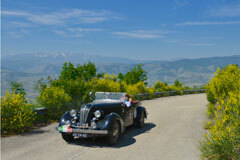 After two nights in Umbria we drive east towards our beloved Abruzzo. 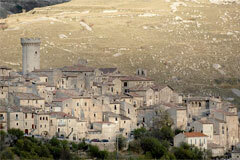 We stay in the absolutely fabulous village of Santo Stefano. 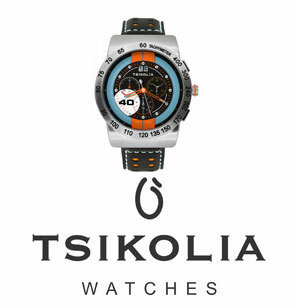 It has been restructured to high standards while leaving the authentic aspect. The next day we drive up the Gran Sasso planes, a region, which was famous for the quality of wool provided by its sheep and part of the state of Florence. This is also why the villages were relatively rich. Personally I must have drive there over 50 times, each time the light and vegetation is different, it keeps on fascinating me. Several years ago we stopped with the Via Flaminia for a barbecue. This has granted me friendship and indefinite free lunches it seems. Now it is time to pay back their hospitality with another barbecue in the middle of the mountains. The last hotel is a castle/palace. We stayed there some 10 years ago. The swimming pool was the scene of some of the best “after rally” fun. 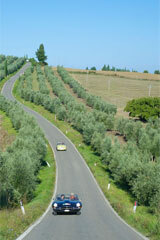 The next morning it is only a small drive to the Airport of Pescara where we will pick up your car. 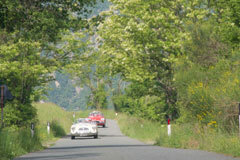 As always, the Via Flaminia is a layback rally where the competition serves the atmosphere, winning is not a goal on itself. Those who want to have a stop for a coffee can do so. No time constraint. The classification is done via navigation and the competition for the last place is sometimes fierce. 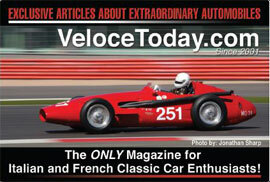 Unless the May edition of the Via Flaminia there is no Sport-class. 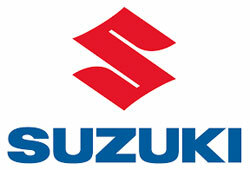 There are 28 entry positions for cars up to 1980. For teams who’s added age is under 100, there is a discount of 1% for each year less then 100, with a maximum of 20% (reference year 2020). 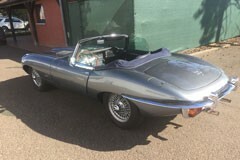 They may also bring a younger car, one year per 2 years younger then 100. 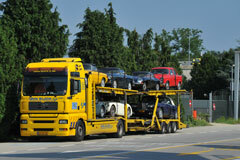 If you have chosen to have your car transported, then it will be delivered at the Firenze Airport upon arrival of the mid-day flights from Amsterdam and London. From there it is a short drive through Tuscany to our first hotel. We leave our cluster of houses near San Gimignano for a drive through the vineyards and over lush hills towards the Apennines. Soon it will be the small roads from village to hamlet to farmhouse, the tractor is the means of transportation. After lunch the mountains get older, erosion has had its toll and we see the silver Adriatic in front of us. 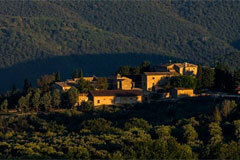 We arrive at the really wonderful Borgo Montemaggiore where we will be staying two nights. We have pretty much taken possession of this lovely village overlooking the Adriatic. So why not stay two nights ? 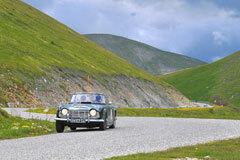 We will be driving some marvellous small roads in Marche. It is amazing how diverse the scenery is, vineyards alternate sunflowers; we drive up hills and see on the left a juxtaposition of hills while the Adriatic shines silver on the right. Each corner brings a different scenery. We leave one village for the other, or actually it is called a castle. I wouldn’t come back as much as possible to central Italy if it wasn’t just fantastic. I love the region, the villages, the people and the food. And of course we will have a great lunch even though you might not feel like it. But Italy is about eating ! The structures of the Tenuta di Salviano and the Castello di Titignano were built in the Middle Ages by the Montmarte family. 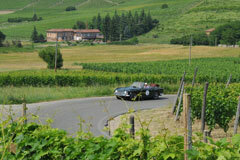 In the early 1800s, the entire property, of over 2000 hectares, was purchased by the Corsini Principi family. The estate under the guidance of the Corsini family became a flourishing company specializing in the production of wheat, tobacco, olive oil and wine. The white wine of Salviano is widely known for its quality. We leave our castle for a short drive onto the small roads in southern Tuscany into Lazio and back, the sun is burning, the air serene and the nature abundant. 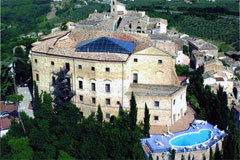 The afternoon you can either indulge at the pool or discover Orvieto. We leave one village for another. We have been in Santo Stefano before and it is just amazing. The houses are interlocked, the pebble-stoned streets narrow and the atmosphere superb. 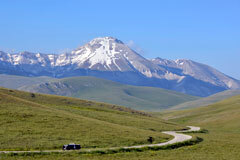 We are on the Gran Sasso mountains which we have come to love so much. It used to be the place where the state of Firenze held its sheep for the wool, thus the villages are relatively rich even though they are “lost” in the high mountains. The last day already, time is flying when you are having a good time. We have a late start. We drive up the Gran Sasso and after each hairpin our village will be getting smaller until we drive over the ridge into one of the most majestic settings imaginable. It could be Scotland or Tibet and was often used as setting for “western” films. 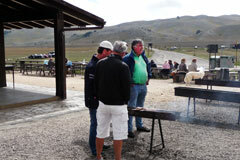 Several years ago we had a barbecue on the Gran Sasso. Ever since, when I come by, they great me with “Bartolomeo” and food and wine is on them. The people in the mountains are authentic and friendly. This year we will again have a barbecue. The last destination is Castello Chiola. A castle with some rooms so big you need a GPS to find back the bathroom. Last time we were guest at the castle the pool was too tempting for some and not all ended in the pool voluntarily. The last day already, time is flying when you are having a good time. We have a late start. We drive up the Gran Sasso and after each hairpin our village will be getting smaller until we drive over the ridge into one of the most majestic settings immaginanble. It could be Scotland or Tibet and was often used as setting for “western” films. 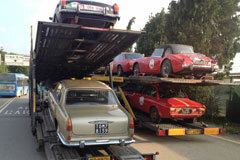 It is only a short drive to the Pescara Airport where a trailer will pick up your car. We will coordinate the pick-up time depending on the best flights to everyone’s destination. Alternatively, and if there is enough interest, we could have a trailer pick up your car at Fiumicino, 250 km away mostly over an astonishing highway. Seven nights in excellent hotels. Early registration (before Sept. 15) for a crew of two: € 2.990, -. Registration (after Sept. 15) for a crew of two: € 3.290, -.